The UN World Tourism Organization likes to cite Costa Rica as a good example of sustainable tourism. Is that justified? DW reporter Lukas Stege investigates. Nature reserves in rainforests, protection programs for threatened flora and fauna, organically farmed cacao for cocoa production – Costa Rica is known for all that, and has a reputation as an ecological role model. When I visited I tried to track down practical examples of sustainable tourism in three places. Watch out! Babies on the beach! I’ve never witnessed a birth, but today I’m seeing several. 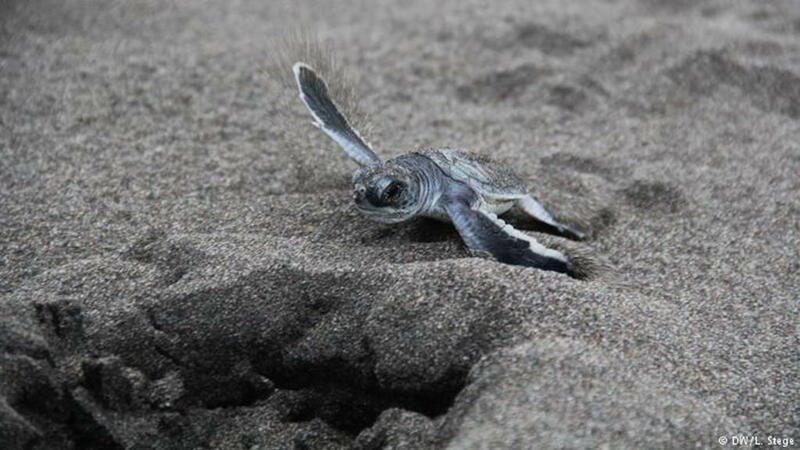 One of about 80 freshly-hatched turtles has freed itself from the hole in which its mother laid her eggs, and is scuttling twenty meters down the beach. There it glides into the lukewarm water of the Caribbean Sea. Its siblings are doing the same thing – but not all of them have it easy, because they’re not alone on the beach. I’m there, along with about 30 tourists. The beach is freely accessible; there are no barriers. A few guides from Tortuguero National Park on Costa Rica’s Caribbean coast are giving instructions: “Don’t get in the way of the turtles! Watch where you step! Don’t help!” The tiny animals have to find their way on their own. But many tourists only listen with half an ear – they’re much too busy taking pictures and filming. “Oops!” A señora next to me has just failed to notice one of the small animals between her legs and accidentally knocked it over, but the turtle picks itself up and keeps going. It’s 5 p.m. – a good time to hatch, as the heat of the day has already slowly subsided. The nesting season of the green sea turtle, which is actually more gray than green, runs from July to October. “There is an estimated total of up to 40,000 nesting holes on about 30 kilometers of beach here,” Diego, one of the guides, tells me while tourists and baby turtles bustle around us. I want to know if there are official rules set by the authorities. Diego’s answer is a terse “no,” even though there are about 200,000 tourists annually in Tortuguero National Park. The sun sets – and we go back down to the beach, this time to a different section of it. It’s pitch-black and suddenly sand flies in my face. The guide turns on his torch and it glows with a weak red light. I can just make out the outlines of what I was able to admire in miniature version in the afternoon. A sea turtle about a meter in diameter is digging a hole in the sand under cover of darkness. She throws the sand far behind her with her flippers. “No photos,” the guide says quietly, not for the first time. Light and noise could disturb the turtle. Only the guide’s dim lamp is turned on occasionally and the beam of light moves over the animal’s shell. After a good half an hour the turtle has finished digging. While she lays her eggs, we slowly retreat. Another half an hour later something moves in the hole. “She’s done,” whispers the guide. Shortly afterwards the animal ponderously moves back towards the water, followed by an entourage of tourists. No one speaks. All keep their distance and tiptoe behind the reptile. Has she noticed us? “We don’t know,” says the guide. 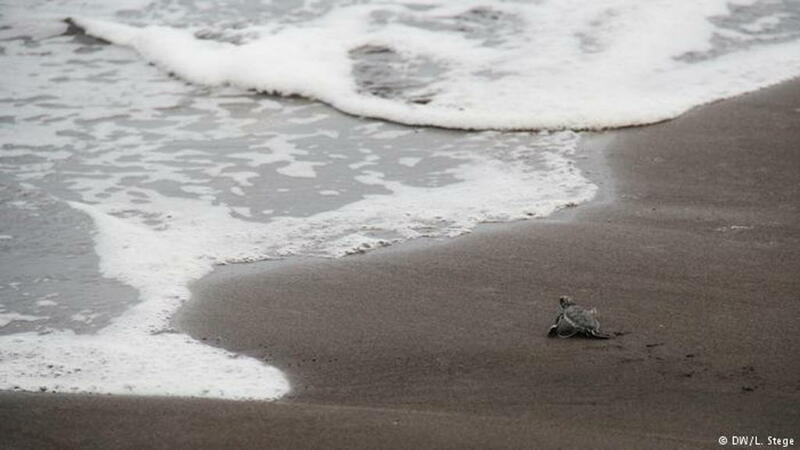 The first small waves lap over the turtle, who continues undeterred and eventually disappears into the sea. The babies will never see their mother – perhaps only hordes of tourists who may be standing near the hole when they first see the light of day. About 60 kilometers from the turtle beach as the crow flies, I’m taking an aerial tramway through the forest canopy. Below me I see the floor of the rainforest passing by. To my left and right, colorful birds sit in the treetops. “That one over there is a red-eyed vireo – an American songbird,” the guide calls from behind us, and the tram car stops briefly. It’s one of 22 that travel through the Rainforest Adventure Park. The park is an hour’s drive from the capital San José and in private hands. 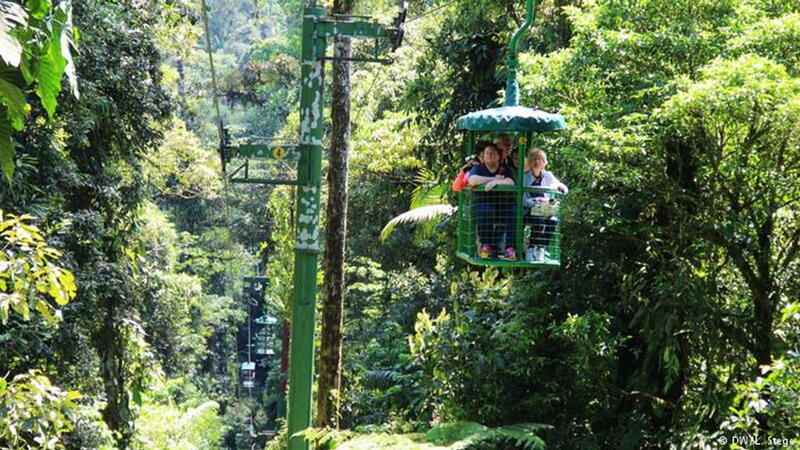 In addition to the aerial tramway, which has stood here since 1994 and is considered the highlight of the park, zip-lining, hiking tours and birdwatching are on offer. 33-year-old Nicolas Staton, General Manager of Rainforest Adventures Costa Rica, welcomes 40,000 to 50,000 visitors a year here. Despite the number of visitors, he says it’s sustainable tourism: “We’ve been climate-neutral since 2012,” he announces proudly. That means that the park’s CO2 emissions are completely offset. Staton can name any number of examples of the sustainability of tourism here. “We are preserving 450 hectares of rainforest, waste is recycled and we use only ecological elements to clean up the park.” He adds that the park provides work for residents of the neighboring communities, which is part of sustainable tourism. “It consists of three pillars: ecological, financial and social development.” Instead of possibly hunting animals illegally or clearcutting in the forest, the locals who work here show its flora and fauna to visitors. And in addition to colorful birds, that fauna includes other exotic animals. On a branch relatively near our tram car sits a huge spider. I notice it quite late, so I’m startled and jerk my camera and arm back into the car. I hadn’t expected the spider – but I did expect the laughter of the other five occupants. We left the well-paved road to the Rainforest Adventure Park long ago, and if our Jeep didn’t have four-wheel drive, we’d be in trouble, because these ten kilometers are not paved at all, and there are many twists and turns. They couldn’t be driven in an ordinary rental car. At one point we even have to ford a river with our vehicle. Tourists have to accept this awkward journey if they want to get to Selva Bananito Lodge in the middle of the rainforest. People who holiday here usually want to relax and switch off. What I have to switch on is my electric torch in the evening, in order to find the way to my small cabin. The sounds of the rainforest are impressive: chirping, croaking and tweeting everywhere. In the cabin itself I’m glad of the mosquito net over my bed, which in addition to an astonishingly small number of mosquitos keeps out a multitude of extremely diverse insects. “This is no walled-off all-inclusive resort. 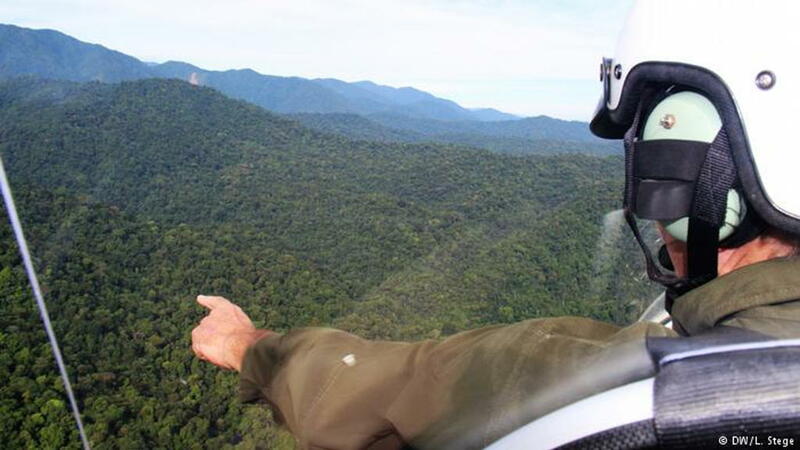 I use tourism as a mechanism to conserve the rainforest,” says 51-year-old Jürgen Stein, who has lived in Costa Rica since 1974 and run the eco lodge for 22 years. But how does that work? “The great mistake is always to look for a quick buck. This is a small lodge with a personal atmosphere,” he says. “I might have 4000 to 5000 guests a year. In the future, our children and grandchildren ought to be able to carry out every activity here without our having destroyed anything.” That means, among other things, that every guest here plants a tree, that water in the cabins is heated by the sun and the soap is biodegradable. Then Jürgen gets slightly irked. That’s due to my question of to what extent his eco lodge might be a mere drop in the bucket where climate change is concerned. “In my forest, more than 500,000 tons of CO2 are stored. The trees planted by my guests alone will make my lodge carbon negative in the next 200 years!” he insists. That is to say, Jürgen gives more to the environment than he takes from it. That’s the opposite of what his father intended when he bought 17 square kilometers of rainforest in Costa Rica’s Limón province four decades ago. He had planned traditional agriculture: cocoa cultivation, banana plantations and animal husbandry. And that always involves deforestation. “My sister and I saw that in clearing the forest he was destroying life support systems.” In 1985 that came to an end. The next morning I see from the air that it wasn’t too late. Jürgen flies an autogyro – a slightly rickety-looking aircraft with two seats that resembles a helicopter. Before take-off I’m still pretty nervous, but in the air I’m so thrilled by the view that I forget my fears. High over “Jürgenland,” as the locals call this neck of the woods, it’s easily to recognize what the father did wrong and the son did right. Three quarters of the area is a rich green in color – it’s pristine primeval forest. A quarter is light green. That part was deforested and is used for farming, animal husbandry and, of course, for the Selva Bananito Lodge. And that’s how it should be, I think – because here I’m the interloper. The monkeys are at home.